That’s a question I ask myself a lot. When you are stopped at a red light on your way to work, is it luck or fate? If the light had been green, would you now be safely at work, or would you be lying on the road with a paramedic leaning over you because some crazy driver ran a red light? I don’t know, but asking this question fascinates me. Wondering about all of the possibilities makes me dizzy. Being me, I’m not satisfied to leave things be. I have to ask the next question. What if it’s neither? What if someone knew what was going to happen, and decided to change the outcome? What if my friend actually died on that mountain? Burned to a crisp? But someone didn’t like that plan, so they traveled back in time, went to the shoe store a few minutes before he walked in, and made sure he had a different pair of shoes? Crazy? I don’t know. But I have spent the last five years of my writing life exploring this question. My Timewalkers not only find out what’s going to happen in the future, but they change things. Big things, like mankind’s odds for survival. And along the way? Well, they fall in love, too. I’ve got a new book now, a book that’s been 10 years in the making. A book that has kept me up so many nights I’ve lost track. This is a story of one human woman who will determine whether or not we all survive, and the man who is brave (and crazy) enough to fall in love with her. It’s a sci-fi action-adventure, a romance, a time travel, and whole lot of fun. To celebrate, I’m launching a new website on Sept.1 with a fantastic month long contest. The winner(s) will get a $50 gift card to the book retailer of their choice or one of 5 ARCs of the book (Release Date Sept 23). Be sure to come back to read more about M.L. 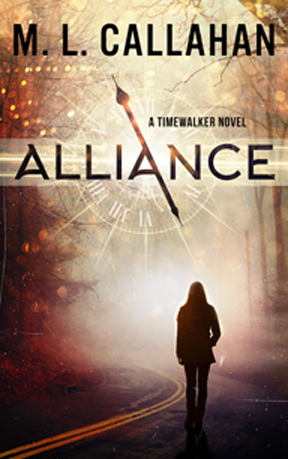 and ALLIANCE, a Timewalker Novel, on Wednesday’s Karen’s Killer Book Bench. Happy Reading! Be sure to enter M.L.’s giveaway for a chance to #WIN a $50 gift card or one of five (5) ARCs (print or digital US and Canada only)! Good morning, M.L., and welcome to Karen’s Killer Book Bench! It’s always fascinating to me to discover where authors get their ideas for their books. I cannot wait to read this book! Thanks for sharing it with us. Oh Ms. Callahan! This looks like one of those “I can’t put it down, I gotta find out what’s going to happen!” books. I can’t wait! !